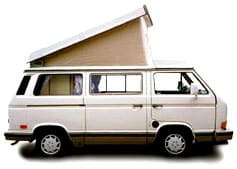 The most successful camper of all time is also a classic car. This beyond cool way to camp sleeps four and navigates the hairpin turns and one lane bridges of Hana with ease. These classic campers do not have A/C or airbags, but make up for it with loads vintage charm. The Westy has a pop-up tent with two double bunks, includes a kitchenette with a sink and burners, and comes with all the camping equipment you need. See the list of what’s included. Since many locals drive VW campers, you’ll blend in on island roads. Maybe you’ll even make new local friends! We have automatic and manual transmissions to choose from. These book up fast, so don’t delay. Kitchen area including gas stove, sink, pantry and a stocked cabinet. Storage space and internal water tank. Linen closet w/ vanity mirror. 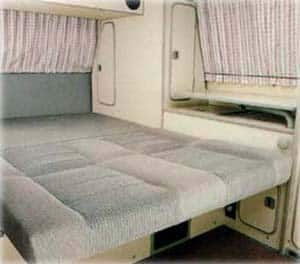 Rear lower mattress that combines with back seat for a full-size bed. The upper bed is exposed when the pop-up tent is opened. Rear bench seat with storage locker. 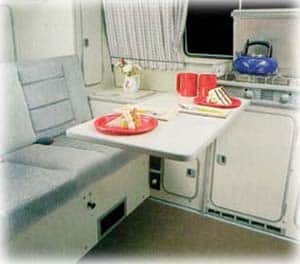 Dinette table front (rear table moves to front). All together, this is one of the best ways to camp anywhere and especially on Maui. Everything you need is included and for those of you that need more, for a small additional fee, we offer upgraded equipment options such as outdoor tables, chairs, BBQ grill, boogie boards, tent, etc. Camping linen kit (2 pillows, 2 towels, blanket, sheets) available at an additional one-time fee of $25. Do you need something that’s not on the list? Let us know and we’ll do our best to accommodate!